Sunday, April 10, was a beautiful Spring day so Mary and I decided to drive into the hills north of Rt. 20 between Marysville and Penn Valley. Our route is shown by the highlight in the map below. We had looked toward the north along Rt. 20 for twelve years as we drove to Yuba City to do our shopping, but never adventured into the area. 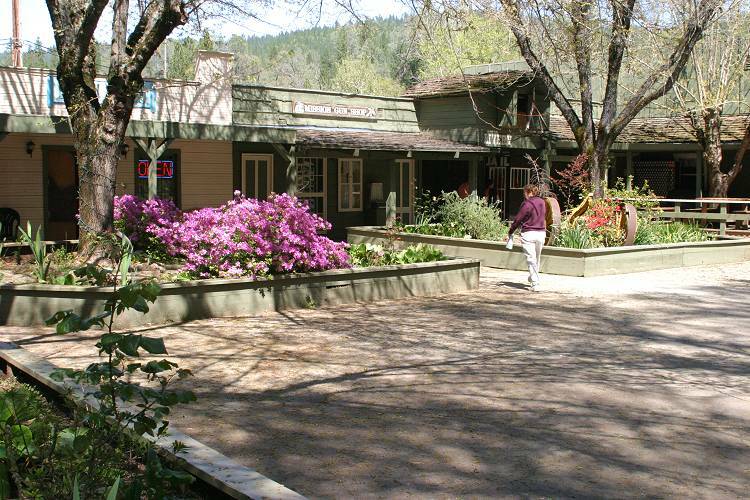 Today, without a care in the world or a map at hand we just ventured north toward LaPorte, where friends own a cabin on Little Grass Valley Lake and other friends own the Union Hotel. Map of Loop to Dobbins and back to Lake Wildwood. But I'm getting ahead of my story. We'd also passed the beautiful farm scene south of Rt. 20 at the Hampton-Smartsville cutoff, the one we'd passed for the same twelve years, and finally, today, we were just on a leisurely tour with my camera at my side so I stopped to take the beautiful picture that had been ingrained in my mind for all those years. Don't forget to scroll back and forth to see the entire panorama in the resulting picture below. Wide angle view of the valley scene south of Rt. 20 near the Hampton-Smartsville cutoff. 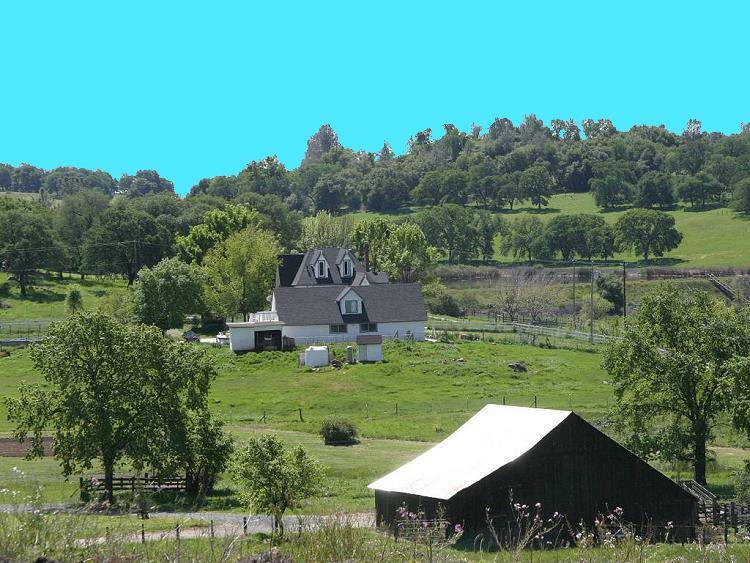 Closer view of the farmhouse at the center of the above scene. Okay, now back to the road to Dobbins. On the way to Dobbins we saw a sign to the Renaissance Winery, so we took the three-mile right detour to take a look. It looked interesting, but, as we already knew, the winery is open only to scheduled visitors so we said hello at the gate and headed back to Marysville Road and Dobbins. We turned right onto a road with a sign pointing to Dobbins and found ourselves in town, which consisted of scattered homes set back on both sides of the road, a church, and a one-room post office building. Past the church another sign pointed toward the Lake Francis Resort and a restaurant. We took this road and came to a pretty little man-made lake (earth dam) where we stopped and ate our packed lunch while sitting in the car. There was a sign pointing toward a restaurant on the left, but we ate in the car because we felt that driving into the restaurant to eat our own packed lunch was not a proper thing to do. Too bad, because when we did drive to the restaurant after eating we discovered that it was just one of many buildings in a Disney-like square that included adjacent picnic tables overlooking the lake. The Square at Lake Francis Resort. The restaurant was tucked into this corner (with the façade balcony). 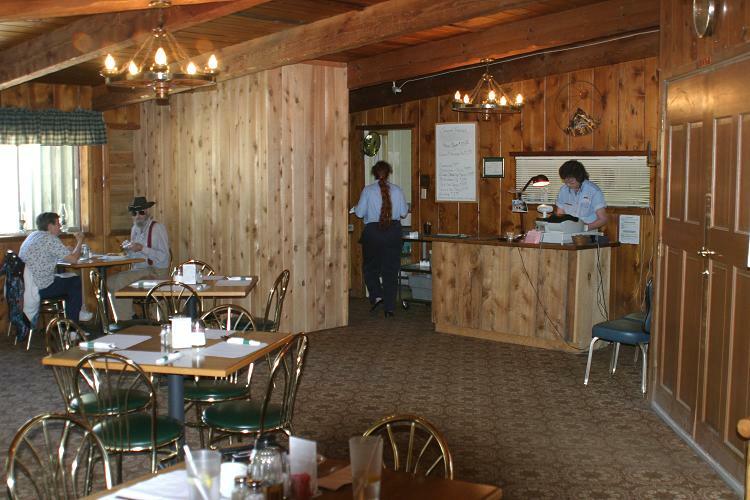 Another view of the restaurant corner, with old-time prices on the balcony sign (e.g., hair cut 25¢). Maitre d' table at the restaurant. Good menu, reasonable prices, appetizing kitchen odors. Had we known this was here we wouldn't have packed a lunch! 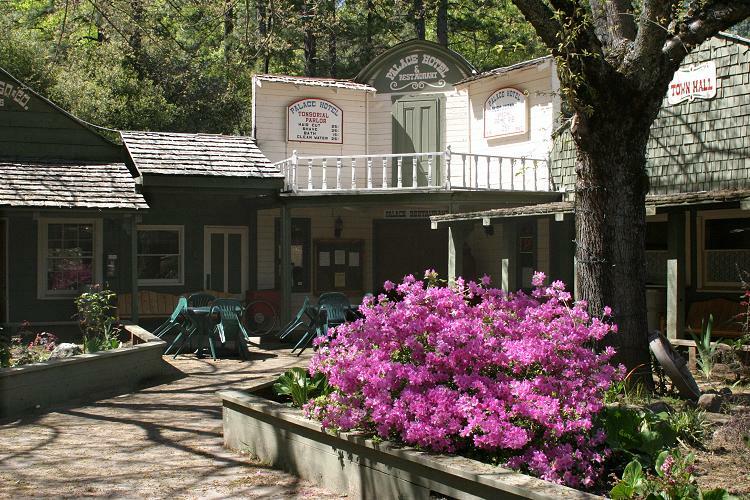 The Square also included a general store, a saloon with sawdust on the floor and a piano for guests, a meeting-dance hall, and a game room with two pool tables and electronic games. 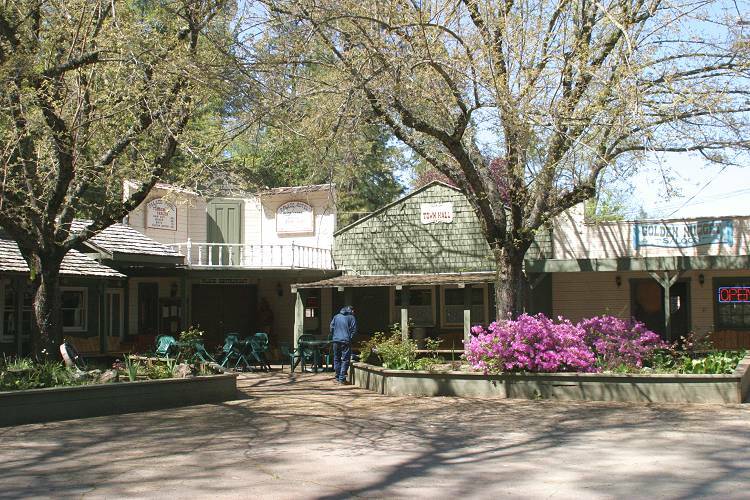 Just outside the square was a foot and golf cart bridge across a creek with deluxe cabins on the other side. 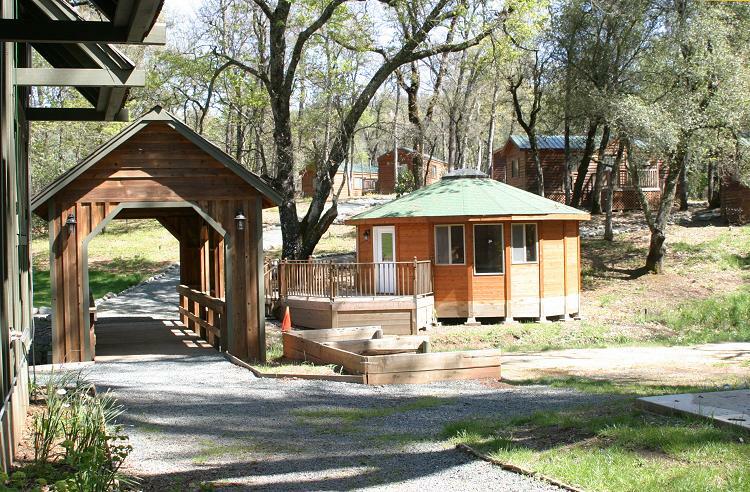 Bridge, activity yurt, and guest cabins beyond. Lake viewed from the Square parking lot. We ate beyond the the gate at lake's edge. At the general store we picked up a map of the hundred or so camping sites (to the right of the lake in this view) and drove over to take a look at them. Some of the sites were densely packed near the campsite gate and didn't look too desirable, but many were larger and tree shaded, and some had full hookups for big-rig campers. 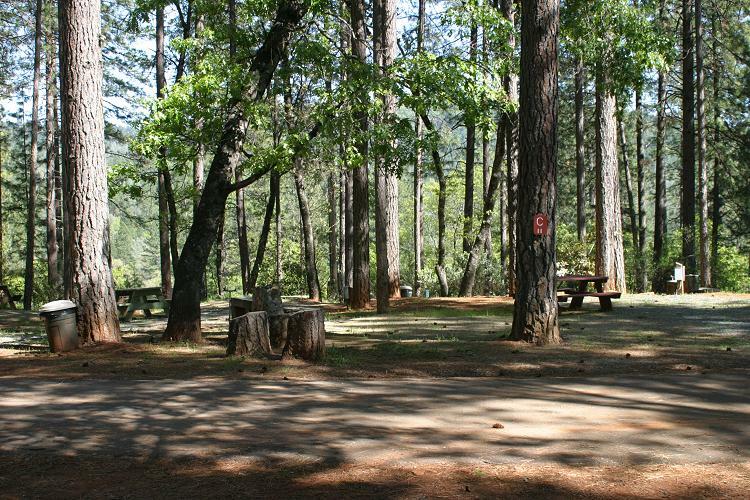 Desirable camp sites at the top of a hill not far from the lake. 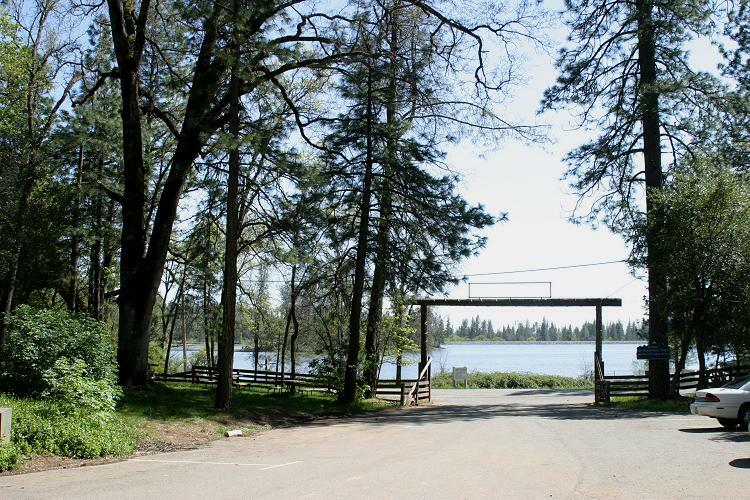 The lake is along side the camping area and has a sandy beach with boat, canoe, and pedal-boat rentals. It's not as high class as the Lindberg Resort but definitely worth looking into if camping with a commercial flair is your cup of tea. Also near the Square is a swimming pool, volley ball court, baseball diamond, and a basketball court. Definitely a great place for groups of active kids. In fact, the resort is dedicated to giving foster children a camping experience, and all profits are used to send these children to camp. You can learn more at their Web site, Lake Francis Resort. Rather than retracing our steps to Lake Wildwood via Rt. 20, we continued on Marysville Road over the dam bridge at Bullards Bar Reservoir and on to Rt. 49. We turned right onto 49 (south -- see the map at the top of this page) and took it to Pleasant Valley road where we again turned right and continued down to the South Yuba River at Bridgeport and then up out of the river basin and back to Lake Wildwood. The total Loop was about 70 miles, and 80 miles with our little side trips. Our Toyota Prius averaged 55.6 mpg over the 80 miles. (On our 124-mile trip to LaPorte and back the next Sunday we averaged 59.0 mpg, because the winding roads forced us to stay below 50 mph for the whole trip).